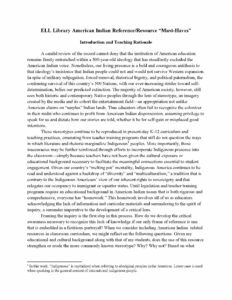 Summary: With the goal of providing materials to inform teachers’ understanding of Native American cultures, Thompson and Smith have compiled an annotated bibliography of “must-read” texts on the subject. This excellent resource can be used to inspire and guide groups of teachers in building local communities of inquiry devoted to Native American Studies. In spite of military subjugation, forced removal, rhetorical bigotry, and political paternalism, the continuing survival of this country’s 500 Nations, with our ever-increasing strides toward self-determination, belies our predicted extinction. The majority of American society, however, still sees both historic and contemporary Native peoples through the lens of stereotype, an imagery created by the media and its cohort the entertainment field—an appropriation not unlike American claims on “surplus” Indian lands. Thus educators often fail to recognize the colonizer in their midst who continues to profit from American Indian dispossession, assuming privilege to speak for us and dictate how our stories are told, whether it be for self-gain or misplaced good intentions.